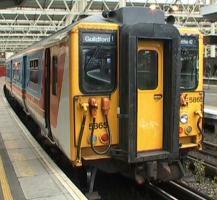 A cab ride journey aboard a Class 455 Unit with South West Trains from London Waterloo to and from Wimbledon Park Depot. After the morning rush hour, units are stabled for a few hours before returning to service. On these journeys we travel via the ramp at East Putney and join London Underground tracks to and from the depot.